The last time I was in Italy I was 14 years old, my mother and I having just been evacuated with the last of the women and children of Western nations from East Pakistan, leaving my father behind. East Pakistan was undergoing a bloody metamorphosis into Bangladesh in a bitter civil war, and we had had our share of stressful martial law for several weeks. My mother must have been under unbelievable strain, having just left her husband in a war torn country, traveling across the Middle East with me, hop scotching from Tehran to Beirut to Rome. In Rome we found some respite where we could decompress, leaving me with vague flashes of memory of catacombs and villas, but nothing very distinct. 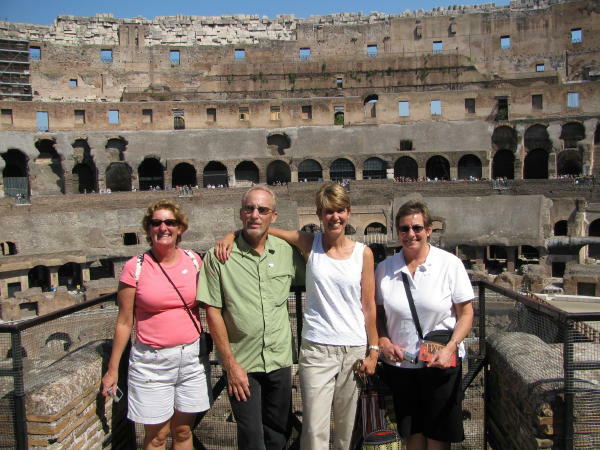 In 2009 my husband, Steve, and I were traveling with two friends, Cindy and Kelli, on our way to spend a week in Umbria, passing through Rome with only two days for the city. 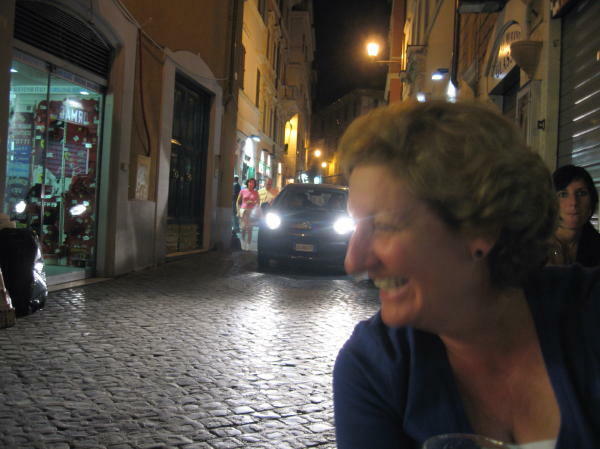 None of my traveling companions had ever been to Rome and not having any strong opinions about sights I wanted to see I was passively carried along on their itinerary, each person democratically nominating one sight they that was paramount on their list. I mentioned something about a fragmented memory of a villa and somehow that made on in the list as an optional side trip. We all ended up completely enchanted with Rome, packing as much as we possibly could into 2 days, propelled through jet lag with the exhilaration of viewing the next breathtaking slice of ancient history. We stayed in the posh Hotel Eden courtesy of Cindy generously dipping into her vast store of Starwood hotel points to put us all up, placing us strategically on the edge of the Spanish Steps and Villa Borghese. 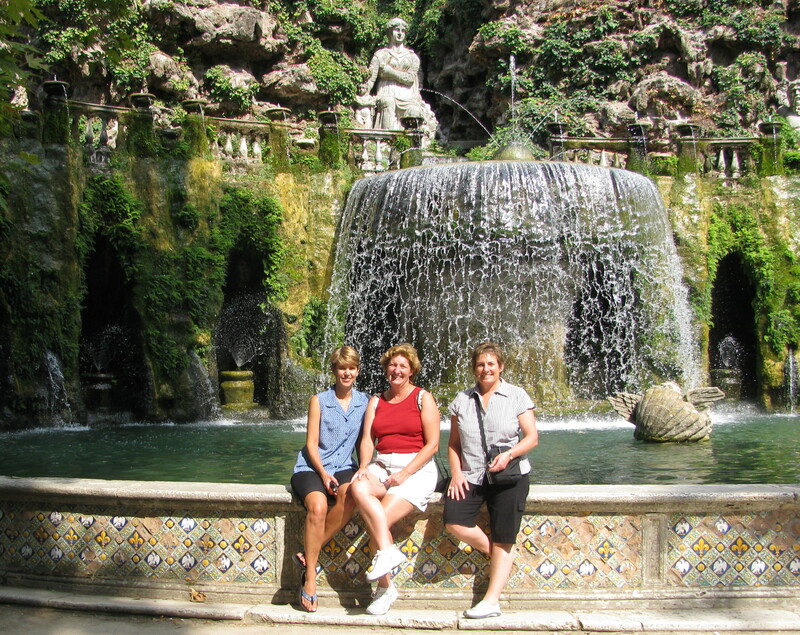 Arriving from the U.S. in the early morning we staggered out of the hotel into streaming sunshine with no nap to descend the Spanish Steps to the beguiling Sinking Boat Fountain. Fed by aqueducts, as are all of Rome’s fountains, this one supposedly contained the sweetest water in all of Rome. We strolled through the beautiful grounds of the Villa Borghese garden, squinting to blur the graffiti that seems to plague all big cities, but seemingly more offensive when applied to structures hundreds or thousands of years old. Grabbing a short nap before dinner we set out to continue our explorations, heading south from the hotel, eyes darting around gazing in wonderment at the dramatic architecture and art that was simply part of the landscape. Soon, small cafes were seen spilling across every sidewalk and into some streets, causing diners to use caution as automobiles slid by inches from their elbows. We sensed quickening excitement and the faint sound of cascading water, suddenly rounding a corner to face the torrents of water erupting from the Trevi Fountain. Built in 1762, the watery panorama was matched by the detailed baroque scenes depicting an arena for the figure of “Ocean” surfing through his kingdom. The two fountains we had seen so far set the stage for our water-themed memories of Rome and the surrounding area. 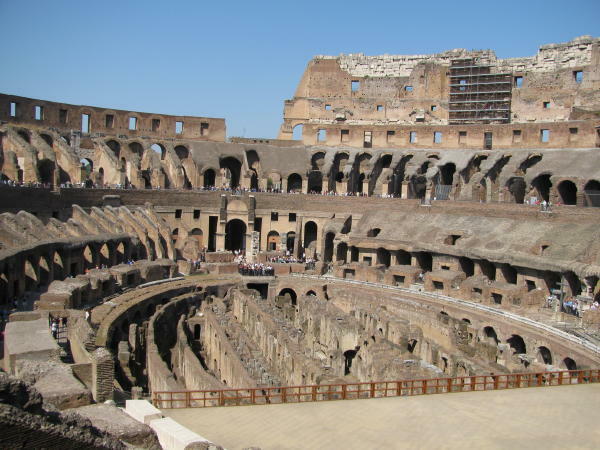 We admired the open dome of the Pantheon, peeked at the handiwork of the Christian catacombs used for vertically efficient burial, and stopped in our tracks at the engineering wonder of the Colosseum. Almost everyone has seen familiar scenes of ancient Rome on postcards, movies, magazines and newspapers but it’s an eerie feeling of déjà vu to see the familiar for the first (or second) time. The scale of the Colosseum is not reproducible on paper or celluloid, the vastness indescribable, the size of the boulders hewn from the crust of the earth and hauled to the fourth story unbelievable. Inadequate superlatives fell from our lips in bursts, giving way to a stammering search for descriptive expression followed by gaping silence and a sigh. But there was more, and after crossing the street we passed the Arch of Constantine, symbol of the mainstreaming of Christianity, and on to the Roman Forum, a sprawling city center and birthplace of ancient Rome, painstakingly undergoing excavation even now. There is still more—above the Forum is Palatine Hill with the huts of Romulus and Remus the brothers who are credited with founding Rome, loaded with still more history. Two thousand years of history is a lot to take in in two days, but we opened our minds and tried to absorb it all, experiencing the best Rome has to offer and none of the tourist annoyances of petty theft or pick pocketing we had been warned of. With visions of our hill town villa in Umbria enticing us onward, we reluctantly packed our bags and departed from ancient Rome, determined to fit in one more expedition along the way. We debated descriptions of the various villas on the tourist trail, bouncing them against my fragmented memories of vast gardens and statues to see if any stuck. The Villa D’Este sounded promising, so off we went, steering our rental car through the maze of Roman streets and out toward Tivoli, ground central for villas. After some difficulty with directions we made our way to the center of Tivoli and discovered that were practically at the doorstep of Villa D’Este. 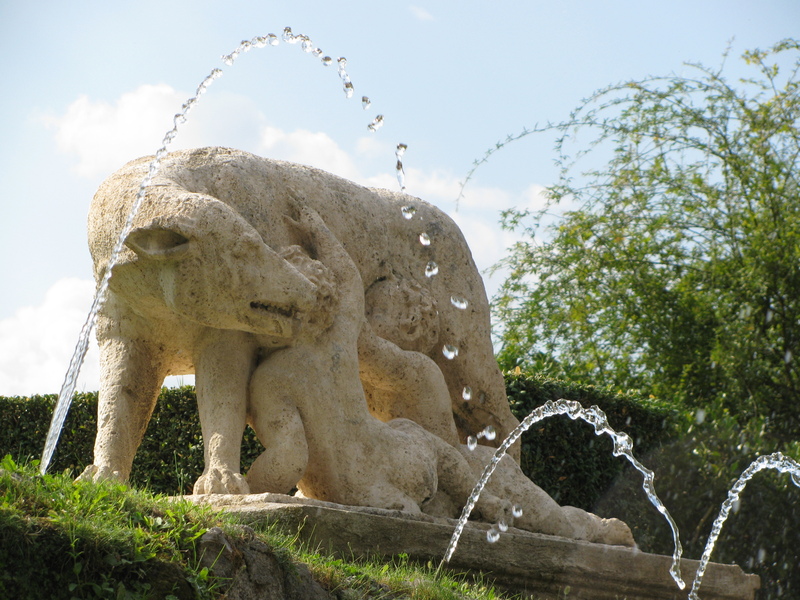 The guidebook emphasized that the villa itself didn’t have much to offer as the grounds were the main attraction. We couldn’t have disagreed more. 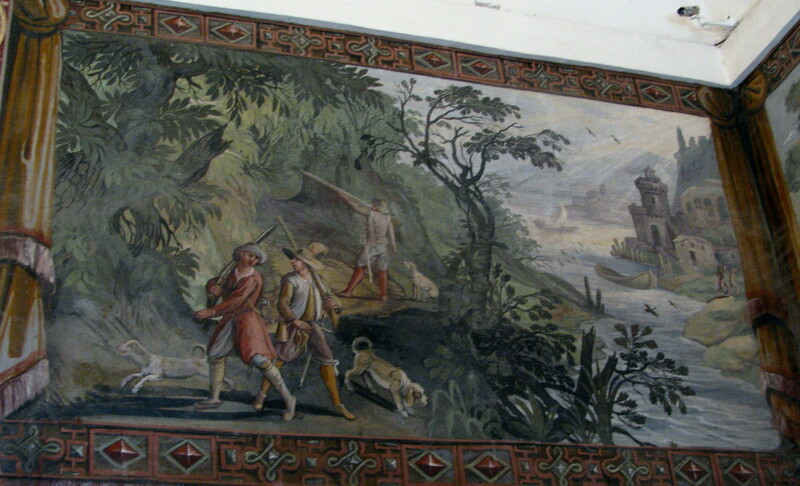 The Renaissance paintings that covered every wall and ceiling depicting various different scenes from hunting to socializing were beautifully detailed, ornate and striking. One section of flooring was cut away to show how the villa was built over the original foundation of an ancient Roman building, a not uncommon finding as the Romans were masters of recycling. After we had had our fill of painted rooms we stepped outside into an aquatic fairyland. Water gushed, spouted, dribbled, burbled, shot noisily into the air and drained into calm pools. Small fountains were tucked into grottoes at the ends of walkways. Huge hydraulically operated fountains shot towards the sky creating a thunderous roar. Delicate arcs of water spouted from the orifices of gargoyles. 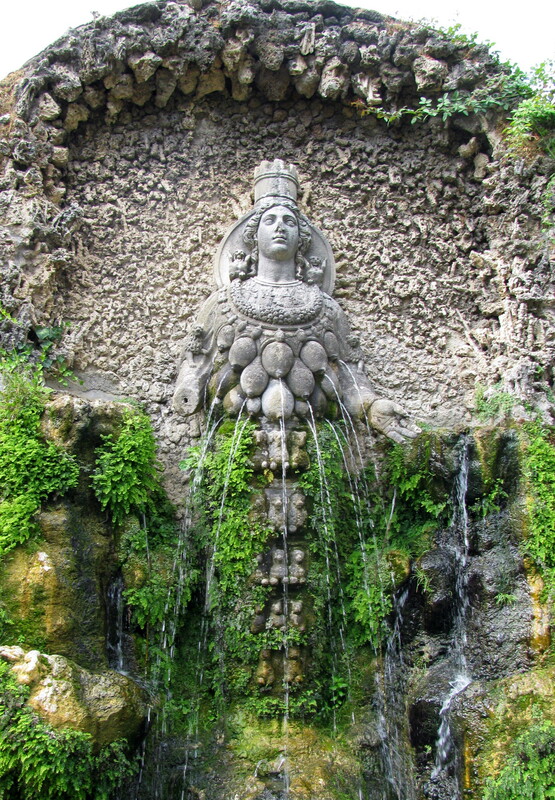 Goddess Nature, a copy of the statue of Diana of Ephesus, adorned with multiple mammaries, poured water from each as she provided life-giving water to the gurgling stream beneath her feet. Conceived and commissioned by Cardinal Ippolito II de’Este in 1550, he directed extensive reconstruction of an existing villa, while creating the spectacular terrace garden in the late-Renaissance mannerist style. The natural slope of the hillside was used as the backdrop but many innovations were required to bring in enough water to supply the cascades, water jets, fountains and pools. All the water is fed by the river Aniene and demonstrates an enviable mastery of hydraulics by the original engineers Tomamaso Chiruchi and Claude Venard in the late 1500s. The water is fed its original single pipe, bringing 300 liters of water per second to the base of the Ovato fountain, and using the principle of communicating vessels, feeds all the other fountains. These water features and techniques were imitated extensively during the next two centuries across Europe. Again we were transfixed by the scale and enormity of the gardens, and our overused superlatives continued to pour from our lips as we skipped from one awe inspiring fountain to the next. Although the Villa and gardens didn’t match my sliver of memory of beautiful gardens I wasn’t disappointed as the Villa D’Este exceeded all expectations. When we became blasé about yet another fountain we were captivated by the Hundred Fountains Avenue, a tree lined path filled with 100 small fountains spouting from different faces and shapes, taking photo after photo of yet another unique face. At the end of the line we came upon a jumble of watery scenes that we discovered were representative of various Greek and Roman figures, from the Ark to Neptune and Atlas to Romulus and Remus suckling from the she-wolf, per the fable about the early years of the founders of Rome living in a wolf den. As the shadows lengthened over the gardens of the Villa d’Este we tore ourselves reluctantly from the beauty of the watery oasis and resumed our trek toward the golden hills of Umbria. Villa d’Este – Location: The Villa d’Este is located in the Piazza Trento, Viale delle Centro Fontane, in the Italian region of Lazio, near the town of Tivoli, 34 km east of Rome on the S5 road. 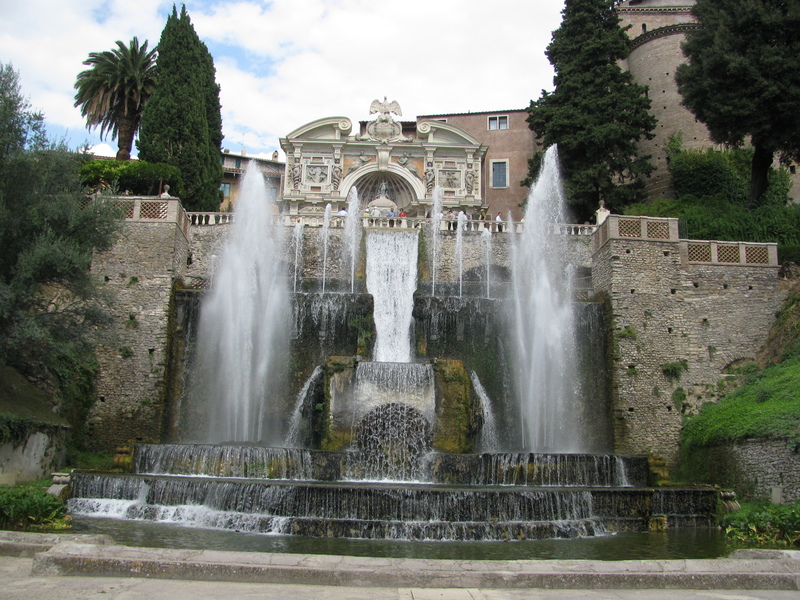 Villa d’Este by Car: Most tourists do the Villa d’Este and Hadrian’s Villa as a day trip from Rome. By car, take the S5 out of Rome to Tivoli. The Villa d’Este is on the western side of town. Tivoli and Villa d’Este Via Train: You can get a train on the Roma-Pescara Line from Rome’s Tiburtina station to Tivoli. It takes about a half hour. 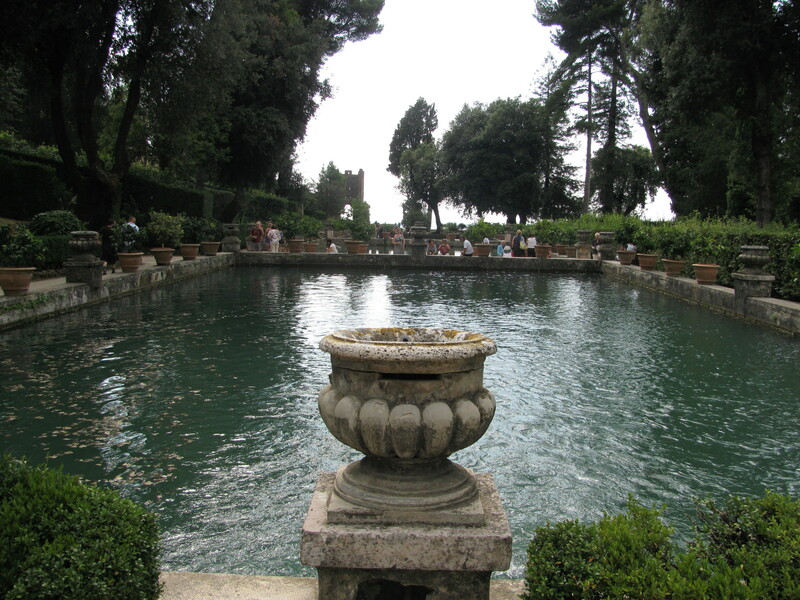 Then you’ll hop a shuttle bus to the town center and Villa d’Este.